Ana Suárez and her son Antonio watch the eclipse from the third floor observatory at Belen Jesuit Preparatory School. Siblings Mariela, 7; Giana, 9; Ivan, 11 and Julian, 13, chose t-shirts with astronomy themes to go watch the eclipse at the Frost Science Museum. 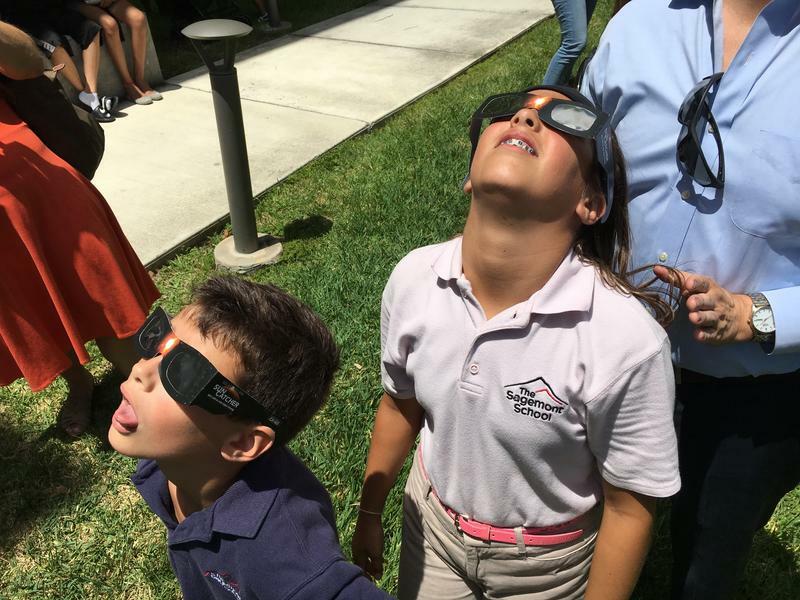 Early dismissal in South Florida schools allowed many families to enjoy the eclipse together. Eclipse viewers gathered at various events in South Florida, including the eclipse party at FIU's Stocker Astroscience Center. María José and María Dolores Betanga took turns using the protective glasses to look at the eclipse from outside the Frost Science Museum. Eclipse enthusiasts waited up to 40 minutes in line to watch the phenomenon from one of the telescopes placed outside of the Frost Science Museum. Jay Baldwin brought his own solar eclipse viewer to share with students and families who didn't have protective glasses at FIU. Hedrick Tussaint, a FIU alumnus, takes a moment to see the eclipse in the middle of his Monday. Clear skies and full visibility conspired on Monday afternoon to guarantee that science enthusiasts in South Florida had an unobstructed view of the solar eclipse traveling through the United States. Although South Florida was not in the area of full visibility -also known as the path of totality- observers in Broward, Miami-Dade, Palm Beach and Monroe counties saw the moon cover up to 82 percent of the sun. In downtown Miami, the Frost Science Museum was overrun with eclipse enthusiasts. 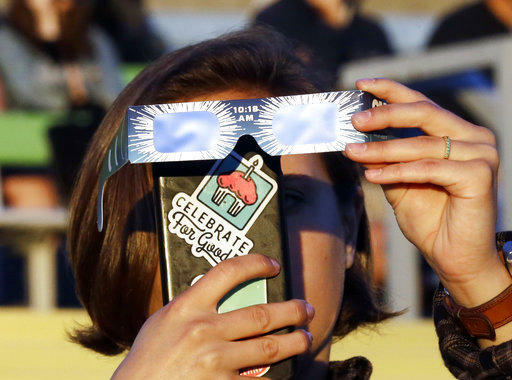 Several hundred visitors shared viewing glasses and waited in line to peek through one of the two telescopes placed in the Science Plaza. 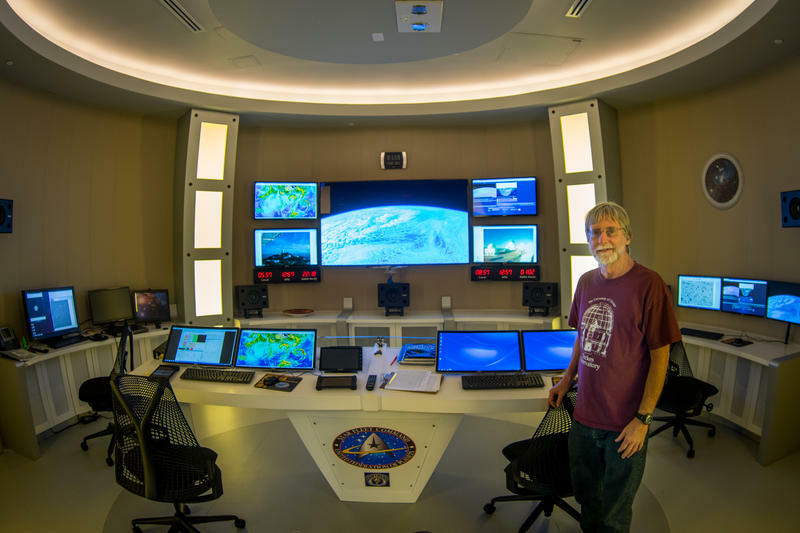 The museum also streamed NASA's eclipse Megacast. "It looks like a banana!" 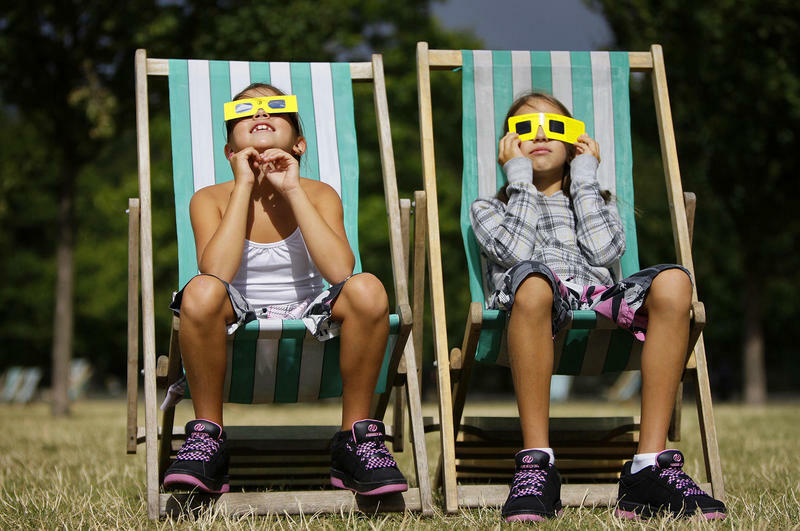 said Leia Mufraggi, 8, after looking at the sliver of sun through her solar viewing glasses. Monday was the first day of school, but her parents picked her and her sister Ines, 4, up early to come to the museum. They were not the only ones, as the museum plaza was swarmed by families -with students still in uniform- looking up to see the progression of the eclipse. The museum ran out of the protection glasses, even for members, but many in the crowds seemed happy to share them so nobody would miss the show in the sky. "We don't mind sharing. Everybody should be looking up now and seeing this," said sisters María José and María Dolores Beletanga, visiting from Ecuador. They took turns to look up through a single pair of glasses and even lent them to another woman they met while waiting at the museum plaza. Hundreds also gathered on the lawn outside Florida International University's Stocker Astroscience Center for their eclipse party, which included the musical talents of Dr. James Webb. Joseph Adams is a senior at FIU who used the pinhole method to view the eclipse. He held his hand in a fist and made a tiny opening for the sunlight to project on his shoe. "On a normal day when you do this, you should just be able to see a little circle," he said. "But today instead of it being a round circle, it looks almost like a little fingernail." At Belen Jesuit Preparatory School, an all-boys Catholic school in Miami, the astronomy club gathered on the roof in the school's observatory. "I saw it at the peak, the most it'll ever be," said Antonio Suarez. He's in fifth grade, and he watched the eclipse at the school with his mom, Ana. She's a computer science teacher there. "It's special to experience this because he'll be a senior when the next one comes," she said. The next eclipse visible from the U.S. will take place in 2024. Live Blog: Follow The Total Solar Eclipse As It Crosses The U.S. The first day of school can be traumatic. Reluctant high schoolers schlep unopened summer reading books aboard early morning buses. Kindergartners sob at being separated from their parents -- and vice-versa.